Marine Walk is one of the most enjoyable 30 minute activities in Boracay Island, Philippines. When we arrived at Boracay Island last February 2010, a lot of locals introduced the activity at a very high price ranging from P2000 to P2500 per person. While walking along the long beach of the island we met Allan who gave us a very tempting discounted price of P900. At first I taught this was the best price I could get for the Marine Walk, so I exchanged contact numbers with Allan and reserved the 8am schedule the following day. Me and Lisa went on with our stroll and continue to meet locals who offered the same activity at P1200-P1500 but no one is better than Allan’s price. The following day, Allan was very excited to fetch us in our Hotel at 7am. He was telling us a lot of things about the Marine Walk. He said we can get free pictures and videos underwater and they will give us a DVD copy of it. He told us that this underwater activity is also called “Helmet Dive” or “Reef Walk” by other locals. Upon arriving at “White Blue”, I realized that Allan was only a middleman, which means he gets good money from selling the activity. If only we went directly to a “White Blue” representative we could have availed the activity for P600-P700 per person depending on the negotiations. We were given a waiver informing us that the company is not liable for any damages and accidents that will happen to us. They also stressed not to destroy the corals. We were fetched by a Speed Boat going to their “Float” in an area full of fish and corals. I tried driving the speed boat going back and forth. When we arrived we were told to put on our swimming outfit and use their free diving shoes. After a preparation of about 10 minutes, everything was set. We had a short orientation regarding the signals underwater. If pressure clogs the ear, simply close your nose using your thumb + pointing finger then blow your nose. You will notice that the air pressure went outside your ear. After the orientation, it’s time to immerse. I went to the water first and then the helmet was put over my head. The full weight was carried by my shoulder, leaving an air space inside it. This is like the concept of a glass turned upside-down and dipped into the water. The difference is that there’s oxygen gradually filled inside the helmet. The 30kg helmet above sea level was about 2kg in water. Lisa was next and we’re now both underwater. The guide / cameraman went underwater also to take us around the beautifully preserved corals and fishes. He gave us bread to feed the fishes. To our amazement, thousands of fish gathered to get some bread. This was a really great experience. It was my first time to be this intimate with fishes. After a very fast 30 minutes of picture and video taking, we went up very satisfied of this one of a kind underwater experience at an affordable price. The next time we will be underwater will be in a scuba dive. I hope you enjoy my story and hopefully you can experience this too. Update (February 29, 2012): During our last visit in Boracay early this month we found out that many are offering the Marine Walk for only P300 pesos. They manage to lower the prices because they are only using an air compressor (used in blowing tires and balls) instead of the pure oxygen tank; some also offer a combination of both oxygen tank and air compressor. If you think you can enjoy your 30 minutes using compressed air, then you can avail the activity at a much cheaper rate. Thanks for this article, my family will be going to Boracay by February 2014 and we want to experience reef diving. I would like to know if white blue still offers the best price for around Php400-600/pax? I have been to Boracay thrice and never tried this one. Good thing that I have read this article and looking forward to try it with my family this November. For the fourth time, I still feel excited to go back to Boracay! Thanks for this article Mark! Thanks for the article. Very helpful! Can you recommend other activities ( cost and with whom) we can try? We are going to Phil next month and will be spending a week in Boracay. pls let me know. I trust your opinion. The best deal anyone can get for the Helmet Diving/Reef Walking activity is as low as 400/pax. You can always make a fair deal esp when you are in group. i can give a contact info of a local who can help you get the lowest rates. By the way, we went to Boracay just recently, Jan. 02-06, 2012. Helmet Diving is an awesome experience! Im going there in feb29. We wanted to do the reef walking. Do you have the contact info for as low as 400/pax? Thanks. Just try asking the locals who will approach you (to offer their services) on how much is their best price. Try to haggle and they will give you a good price. hello can i have the numbers of those locals you are referring to who can help getting lower rates of reef walking? we are planning to go there in december.. and reer walking is one of the activities we are planning to avail… thank you! hello can i have the numbers of those locals you are referring to who can help getting lower rates for reef walking? we are planning to go there in december.. and reef walking is one of the activities we are planning to avail… thank you! Can you please tell me where White Blue is on Boracay. Close to which station or hotel? Thank you for your very informative information. It was quite helpful. White Blue is located in Station 3.
i’d like to know if white blue still offers reefwalking at Php600 per person… thanks… more power!! I don’t know if they still offer it at P600 because it’s been a year since I last visited Boracay – but it should be at most P700 (not peak season) if they increased it. My family will be back there this November. So hopefully we will update the posts/prices. will they be the one to take pictures for you? do they have a camera or dou you have to bring ur own? what if i dont have a underwater camera? They have their own underwater camera and will take pictures/videos of you underwater. Nice Blog. Me and my bf will be there for 4days at the end of this month. I was searching for activities to do and all I need is here. Yes, they are the one provided the service to us – Marine Walk/Reef Walk including gadgets + Photo Shoot + Video Shoot + CD (of Photos and Videos) are included in the P600/person package. I think the price for reef walking is still 600 at this time. Peak season/prices starts in November. You can avail the Marine Walk or Reef Walk anytime of the day. I don’t know if they are open until evening but I bet they’re not (and who would avail if they can’t see the fishes?). As long as the water is clear and the weather is fine, you can avail it anytime. Just approach any person/agent and negotiate until it becomes P600 (or lower) or better yet, go to White Blue directly. 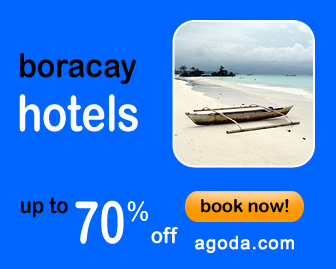 Enjoy your Reef Walking Adventure at Boracay! Thank you for sharing your experience. I was searching for fun things to do in Boracay and your posting convinced me to do this. My family and I have just completed this Marine Walk this afternoon. It was indeed a wonderful experience. My wife (Erlina), son (Sam) and daughter (Kristin) had a memorable experience together. We are looking forward to receiving the pictures and video which my coordinator promised to deliver tomorrow morning (hopefully in time for my hotel departure). Also, thanks for sharing your experience on the fee. I paid Php 600. It’s good that you found my article on Marine Walk or Reef Walking in Boracay before availing the activity. Hopefully you can share my website to your friends and family for their reference. I was searching for fun activities in Bora because I and my boyfriend are going there for the first time. WoW! there’s nothing like mark’s page! it’s awesome! everything I need is in here. Thank you so much mark! I think im gonna visit your page everyday!… hahaha! we’ve done this also last May 4, 2010. An unforgettable experience. I was in Boracay May 24th and did not know about the helmet diving. Can you give me any contact info for the person you went to for this. I will be going back sometime this year. I don’t have any contact numbers. Just go to station 3 and look for WHITE BLUE. They offer the best price and equipment for Marine Walk. d required nga kabalo molangoy? ?hehe..nice experience..
Great article Mark. I saw your articles from your other sites and they were awesome. Cheers to you and Lisa. Very wonderful Mark! This is such a nice underwater experience. Your video and pictures are great.